Why Won't My Cat Sleep In Its Bed? We see it so often. Our customers buy a beautiful, soft comfy bed for their new cat, only to get it home and the cat won’t so much as look at it! But the simple question is – why? The bed is soft and inviting, and yet they go straight back to their spot on the sofa. There are a few main reasons for this behaviour, and with this short guide you can start training your cat to love their bed! Cats have got twice as many scent receptors in their nose as humans, so the smell of a factory-fresh bed is going to seem very strange to your pet. They’re used to your scent – and they probably find it comforting and familiar – so you need to integrate the bed with your home. Me & My Pets Top Tip: Get the bed smelling like you! Sit with it on your lap when you’re on the sofa, place a worn jumper on top of it, even rub your used pillowcase over it before you pop it in the wash! If only cats understood feng shui, they might be a little more forgiving of your chosen location for their new bed. But unfortunately, like so many traditional Chinese concepts, it’s completely lost on felines. If they want to sleep in a certain location, you can bet your bottom dollar that nothing will stop them. There is an element of predictability to a cat though – usually cats will prefer sleeping somewhere elevated from the ground. As a natural predator, they can survey their environment when they are higher up. The top of the wardrobe has long been a favourite sleeping spot for some of the cats in the Me & My Pets team! Me & My Pets Top Tip: Place the bed in the location where your cat most commonly sleeps. Usually this will be a comfy spot on the sofa. As they start getting used to the bed, they’ll become attached to it and will go where the bed goes. Slowly move it a few inches every week to where you would like it to be placed, and the cat should adapt too. Yes, believe it or not there is such a thing. Whilst humans are permanently in search of the comfiest bed possible, cats not so much. Your cat will definitely have a preference for the type of surface they find most amenable, so try to mimic that with their bed. 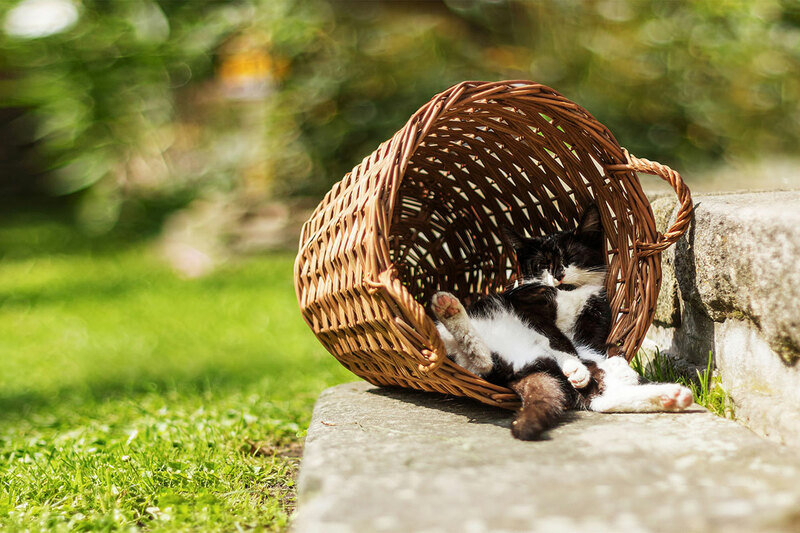 If your cat likes to sleep on a hard surface, consider getting them a raised woven bed. If they like to sleep on your bed, the cotton of the duvet cover might be their preference, so try placing a pillowcase over the top of a fluffy cat bed. If your cat is a hider, then an igloo bed is perfect for giving them that sense of security they need. For heat seekers, this plush radiator-hanging bed (or this super fluffy one!) might just be the perfect spot. Me & My Pets Pro Tip: Cats which are more unsteady on their feet might feel unstable on a squidgy bed. Try to look for something which offer structural integrity and is nice and solid underfoot.